Kale is one of the world’s best “superfoods”, and growing kale at home is the best way to bring its nutrition to the table, because the longer produce sits around in the fridge, the less nutritious it is. Vitamins degrade in produce with age (this is true for all produce, but especially leafy greens), so eat it fresh. Kale contains huge amounts of vitamins K, A, and C, and is particularly high in two types of antioxidants (carotenoids and flavonoids) that are powerful anti-cancer agents. Along with collards, chard, and spinach, kale tops the charts for nutrient-density and health-giving benefits. Kale is a biennial, meaning it grows leaves the first year, overwinters, and then in the second year it flowers, makes seeds and dies. Because it is grown for its leaves, it goes from seed to table much more quickly than fruiting crops like peppers, tomatoes or cucumbers. Depending on variety, you can be eating it 40-50 days after planting the seeds. 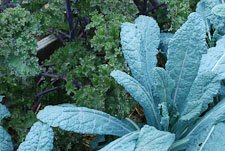 Kale is frost hardy down to about 20 degrees F., so start growing kale very early in the spring, and then plant a new crop in late summer for a fall (or winter) crop. Growing kale in the heat of summer makes for tough and bitter leaves, so for the best eating, grow it at both ends of the growing season. It improves in flavor and sweetness after it experiences frost, or even a hard freeze. When I lived in Montana I grew large Scotch kales, and then the snows would come and bury them. At first it was easy to see where they were by mounds in the snow, but as winter went on and the snow got deeper and deeper, I had to mark where they were with tall sticks. It was fun to go out in below zero weather and dig down through the snow for some frozen kale to bring in for dinner. It tasted delicious! Scotland and Russia are both known for bitter winters, and it seems the bitterer the winter, the sweeter the kale! Growing kale in areas of harsh winters provides people a year-round source of vitamins and minerals. There are many other varieties of both heirloom and hybrid kales, so try some different ones to experience different flavors, textures and colors. That’s one of the great perks of growing your own vegetable garden – you have choice! Like other leafy green crops that are packed with nutrition, kale needs nutritious soil, which means compost, compost, and more compost. It also appreciates high-nitrogen organic fertilizer such as blood meal, fish emulsion, or feather meal. 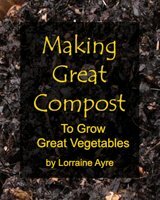 Compost made with manure or lots of coffee grounds (get ‘em from your local bistro or Starbucks) will also supply some nitrogen. Growing kale requires plentiful, regular, deep watering as well. We have ours on a drip system this year which works great. We got 50’ rolls of ¼” black tubing with built-in drippers at 12” centers for about $8/roll at Home Depot (in 2012), and rigged up our own drip system. Tito is an engineer by trade and is pretty handy at building me stuff, so he rigged up a brilliant (and cheap) “pressure regulator” for the drip system using a PVC pipe shut-off valve, which we just use to regulate flow, not to shut off completely. Steamed kale is actually better for you than stir-fried, baked-in-oil (makes “chips”), or boiled in soups. (All are ways that I enjoy eating it.) In researching this, I discovered that steaming kale makes more of the nutrition within available for absorption by the human gut, and that this is enhanced even more if served with a little lemon or vinegar, which helps unlock the minerals. Tito and I love it steamed with salt and lemon juice, but mostly I add it to a huge variety of vegetable-based soups that I make. I think I could live on soup, even in the heat of summer. The complexity of flavors in well-made soups is just so satisfying. Kales are relatively resistant to diseases, and seem most attractive to bugs like flea beetles, cutworm, cabbage loopers, imported cabbage worm, and club root only when they are little. You can protect your crop from damage by covering the kale bed with Reemay or other brand floating row cover, or you can cut the bottoms off paper cups and insert them into the soil around the stems of young kale to protect them from cutworms. If they end up with cabbage loopers or another leaf-chomping bug, see the Plant Pests article. Spraying kale babies with dilute fish emulsion spray will seriously repel flea beetles. Have fun growing kale, and diversify your diet with its yummy deliciousness. And send me photos of your kale garden, your favorite recipes, or anything else you’d like to share about your kale experience. The more the merrier, we can all learn from each other.